HomeallMy Twitter Video – Check it out and share yours! There is no shortage of posts here that cover my love of Twitter. My latest post less that a month ago details my appreciation for Twitter six years after first joining the micro-blogging service that grew into a social media powerhouse. Today I surfed into an interesting new service that analyses your of your Twitter activity; your top posts, top followers even your top photos tweeted and mashes it all together in a short quickly share-able video with customizable audio. 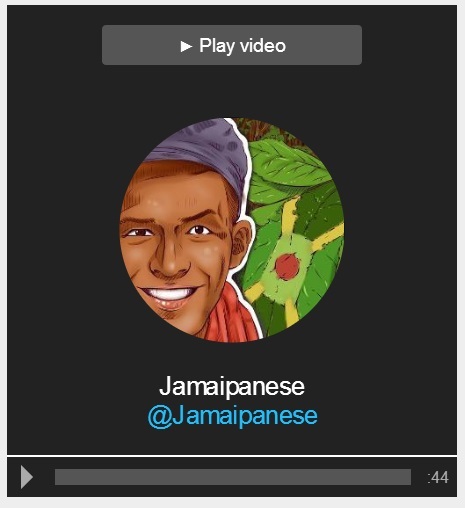 I am a sucker for statistics and it didn’t take long for me to plug @Jamaipanese into the Vizify tool and out popped my video. Check it out here. Unsurprisingly I tweet a lot about Jamaica, Japan and my favourite football team. Surprisingly one of my most popular tweets speaks about saiyans and transformers landing on earth with another requesting a fish to climb a tree. Mix in my soon to be introduced new kitten companion and photograph of Somerset Falls and I’d say this video represents my Twitter adventures well. Create and share your Twitter Video! Twitter users? go ahead and plug-in your account and share with me via a comment or tweet me @Jamaipanese the results so I can take a look. I am always surprised on many new ways people find to idle on twitter.